You are here: HomenextTopicsnextViews of the city: images & opinionsnextMystery photos of Brighton and HovenextCan you identify this Brighton school? 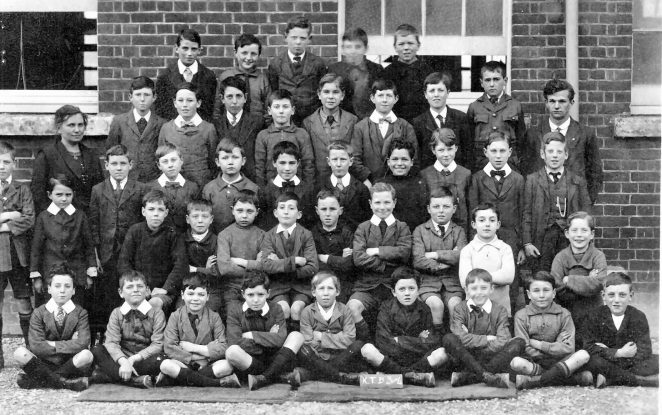 This photograph of the boys in a Brighton school was taken in 1915/16. My father Arthur, (nickname Tim) Peerless is seated on the front row far right; he was born in Brighton in 1905. Arthur emigrated to the USA at the age of 16 in 1921. His parents were both in service before leaving England. In front of the boys is a sign that says KTB 3 and 4. I wonder if anyone can identify the school from these initials? I am almost sure the photo is taken in the playground of now demolished St Mark’s Junior School in Arundel Road; I have a school photo taken in amost the same place. I would venture to suggest that KTB was Kemp Town Boys school classes 3 & 4. However, just a guess. This is St Mark’s, Arundel Road, Brighton. Sadly it is all gone. Most definite – this is St Mark’s. If you look at the picture of Class Photo 1967, (located in areas: Whitehawk/ St Mark’s School/Arundel Rd) it was taken in the exact same place. Dunno about the school, but, boy, those high collars look pretty uncomfortable!